Kid’s running shoes should have the same support features as adult shoes. 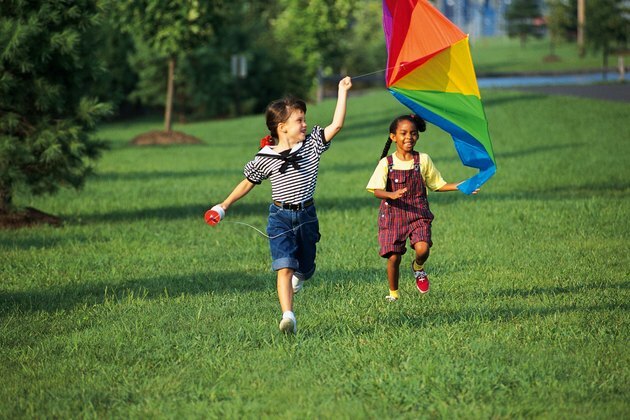 Children need arch support, heel cushion and shock absorbency in their running shoes. It is often difficult to find these features in shoes for children in toddler or baby sizes. Once a child is involved in track or running on a regular basis she needs a quality shoe to keep her feet healthy. Sturdy, ankle support shoes are also beneficial to prevent turned ankles and other foot and leg problems. The biggest pitfall that parents can fall into when purchasing children’s running shoes is to skimp on the price. Quality children’s shoes are as expensive as adult shoes, but if you purchase a cheap alternative, then you are risking the health of your child. Try to purchase the highest quality of shoe that you can afford to provide the best comfort and stability for your child as she runs and participates in an active lifestyle. Always choose shoes that fit comfortably around the toe and snug around the ankle for maximum benefit. Quality children’s shoes can be difficult to find. Low-budget retail stores may not stock quality brands for children. The best place to find children’s running shoes is at shoe stores and athletic or sporting supply stores. Kid’s Foot Locker is one quality retailer that offers many brands of children’s running shoes. They offer foot sizing and can recommend the best brands for different sporting activities and race lengths. Sports Authority also offers many top brands for children’s running shoes with competitive prices. Expect to pay between $30 and $80 for a high-quality kid’s running shoe. This cost varies with the brand and size of the shoe. Larger sizes cost more than smaller sizes in most cases. Any shoes that cost less than $30 probably do not have the support that a child needs for running and intensive sports.